In the latest winter go holiday event, Hwang In-seong 7d (right) will teach go ‘apres-ski’ during six nights at the traditional Go-Ski in Pragelato – host of the cross-country race during Winter Olympics of 2006 – in the Italian Alps near the French border. The event will take place between December 27 and January 2, organized by AGI, an independent Italian Go Association. Other European holiday go events include the Dutch Wintergo with Yoon Young-Sun 5P and the December 28-31 London Open where Zhang Yanqi 6d – current French Champion – is one of the favorites. KOREAN GO SCHOOL ACCEPTING FOREIGN STUDENTS: Foreign students have until November 31 to apply at the department of Baduk Studies, Myongji University in Yongin, Korea. Check the pages of the admission office as well as the department’s homepage for details, or email Daniela Trinks. 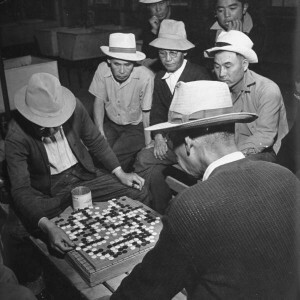 GO SPOTTING/GO PHOTO: A 1942 Life Magazine photo of Japanese American men playing go at the Heart Mountain Relocation Camp in Wyoming is among the Life go photos* found online by EJ reader Troy Anderson. Another one shows “Japanese go game being played at alien relocation camp,” while a third shows Japanese prisoners of war Kiichiro Hiranuma and Toshio Shiratori playing go and a fourth depicts prisoner of war Akira Muto playing go with rough pebbles on a paper board. Click here for background on the relocation and internment of approximately 110,000 Japanese nationals and Japanese Americans during World War 2. In 1988, Congress passed and President Ronald Reagan signed legislation apologizing for the internment on behalf of the U.S. government. * the site where these photos were originally posted no longer exists; we’ve included new links for three of the four shots; if you locate the one of Akira Muto, please email us at journal@usgo.org. GO FOR THE BLIND: In response to a recent EJ classified inquiry about blind go, a reader referred us to the British Go Association’s Go for the Blind page, which contains information on playing blind go and pictures of special go sets. 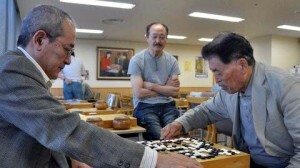 MISSING MEIJIN GAME: “I’ve been studying the Meijin matches sent through the E-Journal for this year’s title,” writes reader David Lang. Is there a reason why the 5th match never came with the E-Journal? Perhaps I missed it.” See attached; click here to download all five Meijin games. SHIBUMI THE MOVIE? : ”I was wondering if Shibumi the movie had ever been made,” writes Heidi. “I have a friend named after the character in that book, and I’d love to get him a copy for his birthday.” According to an undated entry on Trevanian.com. “Shibumi will be turned into a movie by Warners some time soon. The project is well advanced and filming will begin soon.” While the authoritative and comprehensive Internet Movie Database (IMDB) has no reference at all to a movie version of the novel, which features go-playing assassin Nicholas Hel, the New York Times website does, listing Keanu Reeves as playing Hel, Warner Brothers as the studio and five screenwriters but no director. All in all, a bit of a mystery. 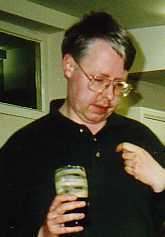 Trevanian – who died in 2005 – would have been pleased. “From time to time someone asks how the AGA selects players to attend international championship tournaments,” says Tournament Coordinator Phil Waldron. “Eligibility is not complicated, but it does require some planning.” To be eligible, players must be US citizens or Green Card holders and reside in the United States. “We also expect players to support the American go community and so players must have been a continuous member of the AGA over the past twelve months and have played at least ten rated games over the same time,” Waldron says. “Finally, potential competitors must meet any additional eligibility requirements set by the tournament sponsors; for example, you won’t be going to a youth event if you remember Woodstock.” Full details about the various international tournaments and their selection tournaments can be found on the AGA Major Tournaments webpage.